I have long complained of the absence of recordings of Hilary Tann’s music. Now, here is a disc entirely devoted to a cross-section of her chamber music. This allows a better appraisal of her output. This is assisted by the selection having taken in works from a span of more than twenty years. The Walls of Morlais Castle - originally composed for flute, guitar and cello - is heard here in a later revision for oboe, viola and cello. The music alternates between calm, pastoral episodes suggesting the surrounding landscape and livelier ones suggestive of “the hustle and bustle of the former castle”. This is a lovely, colourful and warmly melodic work of great charm. 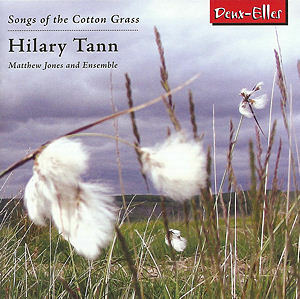 Songs of the Cotton Grass is a short song-cycle for soprano and viola to words by Menna Elfyn. The songs were composed between 1999 and 2005. The first was originally for mezzo-soprano and the revised for soprano. The settings for voice and stringed instrument remind one of Holst’s Four Songs Op.35 (1917) and of RVW’s Along the Field (1927); none the worse for that. The Cresset Stone for solo viola has been recorded before: in “Celtic Connections” on Capstone CPS-8640. A cresset stone is a hollowed-out stone, filled with oil and used as a lamp. The work is “a meditation on stone and light” and, to these ears, evokes the light and shade in Brecon Cathedral that contains such a stone. From the Song of Amergin is for the “Debussy trio” of flute, viola and harp. The composer mentions that three lines from Robert Graves’ restoration of the text of an ancient Celtic calendar-alphabet, the Song of Amergin, directly inspired the piece. By avoiding any obvious programmatic scheme the music leaves much to one’s imagination. “I am a wind : on a deep lake/I am a tear : the Sun lets fall/I am a hawk : above the cliff”. This is beautiful and attractive, and a worthy alternative to the celebrated and ubiquitous Debussy sonata. The somewhat earlier Duo for viola and oboe may present a rather unusual instrumental combination - I cannot think of another example. However it works remarkably well and the rather unpromising title conceals a lively and at times fairly animated dialogue between the instruments. The piano trio Nothing Forgotten has also been recorded before on North/South N/S R 1027 reviewed here some time ago. If The Walls of Morlais Castle, The Cresset Stone and From the Song of Amergin refer to Tann’s Celtic roots, Nothing Forgotten points to the Adirondacks where the composer lives. The piece is in three movements played without a break and the music briefly quotes from and alludes to two Adirondack songs. Again, this is a beautifully melodic and warmly lyrical. It repays repeated hearings. This programme is centred on Matthew Jones’ immaculate playing and faultless musicality in which he is matched by his partners. All in all this is an attractive release and is well worth more than the occasional hearing.